St. Louis SPARKS with Children First! For Your invitation click here! 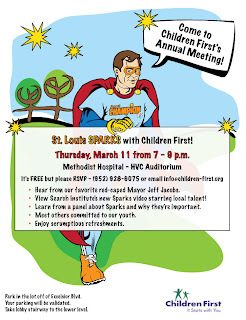 Don’t miss Children First’s Annual Meeting on Thursday, March 11, 7 – 9:00 p.m. at Methodist Hospital. St. Louis SPARKS with Children First! Sparks is relatively new research from Search Institute. A Spark is a special quality, skill or interest that lights us up and that we are passionate about. A Spark comes from inside us, and when we express it, it gives us joy, energy and contentment with our lives. A panel of adults and teens will explain why Sparks are important, what they do, why they do it and give you tips on your Sparks endeavors. View the new Search Institute video about Sparks featuring local talent, Teens from St. Louis Park’s Youth Development Committee are featured. Join the evening’s moderators, Children First Co-Chairs Kelsey Reid and Chief John Luse for this inspirational and fun event. There will be time to interact with others committed to our youth. You just may see the mayor swoop in! It’s free to attend, but reservations are required. Feel free to invite others to come with you. Click here to RSVP. Your name and organization is all that’s needed. Park in the Blue lot off Excelsior Blvd. Bring in your parking ticket to be validated. The meeting will be held in the HVC Auditorium. Take the stairway in the lobby by the fireplace down to the lower level. Click on the graphic above to view full size and print it out.